"Welcome, watchers of illusion, to the castle of confusion." 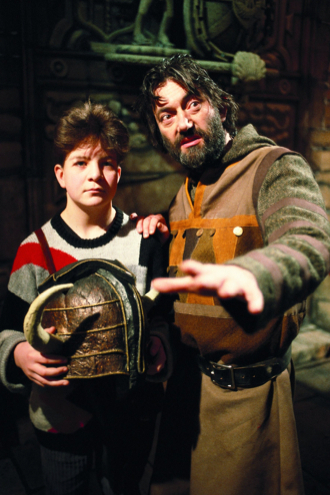 So said Treguard, dungeon master and host of possibly the greatest children's game show ever created: Knightmare. The programme originally ran from 1987 to 1994 and is one of my all-time favourite TV shows. 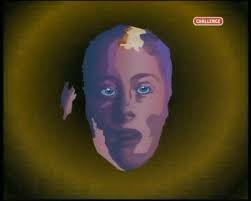 In recent years it's enjoyed repeat screenings on Challenge TV. I've been slowly making my way through all the episodes and, having reached the end of series 2 and the end of what is the first of several phases the series went through, I thought I'd share some thoughts. For those who haven't seen Knightmare the premise is fairly simple. Treguard has opened up his dungeon to challengers from 'our world'. These challengers were children in their early teens who would wander through the dungeon completing quests all the while dealing with the various characters, traps and puzzles that they met along the way. The kids were always encouraged to use logic and guile to find the right path through the dungeon ,using brains rather than brawn. Basically, Knightmare was Dungeons & Dragons for kids. The dungeon was brought to life using a technique familiar to many Doctor Who fans: blue screen, or CSO. 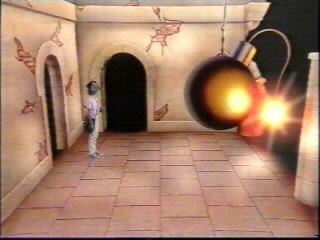 This meant that the intrepid 'dungroneer' could you projected into any number of rooms and caverns within the dungeon.In the first two series's all of the backdrops were hand painted, later series would see the introduction of CGI elements. 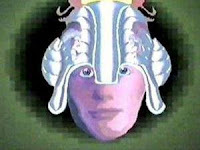 In order to preserve the illusion for the dungeoneer, they were made to don a huge helmet that completely covered their head and meant that they could see nothing. This of course meant that they couldn't see that they were in a blue-walled television studio rather than a dungeon. Each dungeoneer had a team of three friends guiding them through the dungeon. These helpers (many of them apparently called Mark) would stay at the entrance to the dungeon and watch events on a screen, seeing what the dungeoneer couldn't and guiding the dungeoneer by yelling instructions at them. Traguard was always on hand to offer help, advice and the occasional put-down when required. During the first two series each quest followed a fairly familiar format. Early on in the first level, the team would usually encounter one of friendlier characters - maybe Folly the jester or Gretal the serving maid - who would usually provide a bit of useful advice. Then, after dodging a trap or two, like a giant scorpion's snapping tail, it would be on to the Level 1 clue room. Here several potentiality useful objects were laid on a table and the team would have to work out which ones to take. 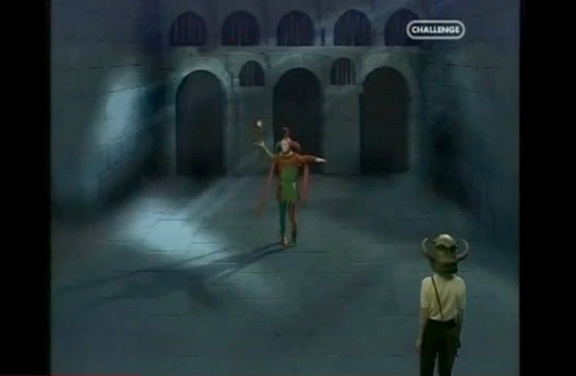 Before they could do that though they would have to answer three riddles given by one of the Wall Monsters. The more riddles they got right, the more help they got with their quest. Once past the Wall Monster, the team would choose their objects and go on. At this point more than one team came a cropper. If they picked the wrong items then they could struggle to bribe their way past some of the less friendly characters, whether they be the witch Lilith (who dropped several dungeoneers down a chasm), Olaf the barbarian or Mildred, another witch who tried to trick people into climbing into a cauldron. Assuming the dungeoneer survived these obstacles then they would usually find a well that would take them to level 2. Level 2 wasn't seen as often as Level 1 as not every team got that far but there were a few familiar elements. The opening room of the level would, more often than not, see the team encounter Cedric the Mad Monk who would insult the dungeoneer before giving them three riddles to answer. Then it was on to another room with clue objects before, more often than not, an encounter with Merlin the Magician who would provide help after testing the team with another set of riddles. This was also the point at which we learn of the main villain of the dungeon, Merlin's 'alter-ego' Mogdred. Incidentally, both Merlin and Mogdred were played by John Woodnutt, who had made several guest appearances in Doctor Who in the 70s. After the meeting with Merlin there were usually a couple more traps to be overcome and then the team would reach another well to Level 3. This, perhaps not surprisingly, was only seen a few times in the first two series Level 3 would usually see the dungeoneer having to run away from cavern wrights, creatures that looked like a cross between a Womble and an Ood, brave a few more traps, cheer up a depressed gargoyle and meet up with Mogdred one last time before reaching the end of their quest. In fact only two teams actually completed their quests, both of them in Series 2. Overall, I've really enjoyed re-watching these first two series and they've brought back a lot of memories. One thing that is more noticeable when watching the episodes back to back is how repetitive it is. There really doesn't seem to much variation to the quests and even poor Treguard repeats his instructions word for word every time a new dungeoneer enters the dungeon. Of course you're not really supposed to watch the series back to back and I certainly don't remember being particularly aware of the repetitiveness when I originally watched it back in 1987-88. That being said, the producers may well have been aware of this when they were making it as there does seem to be a real effort to mix things up a bit more in Series 3 from what I've seen of it. Besides, even if the dungeon rooms themselves happen to be a bit samey, there's still much enjoyment to be had from the various teams that venture into the dungeon. It's always amusing to see them panic when they walk into a room with a live bomb about to go off. Or when the dungeoneer's advisers get their lefts and rights mixed up and accidentally direct their dungeoneer to walk off the edge of a cliff. One well-remembered incident from these early series amongst fans is where one team was gifted a spell called 'Shovel'. 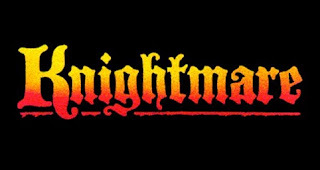 To cast a spell in 'Knightmare' one had to simply spell out the name of that spell. Unfortunately for this team, when they needed to use the spell they forgot its name and wasted too much time trying to cast a spell call 'Spade' instead. Needless to say things did not end well. To sum up then, these first two series are a lot of fun to watch but, especially with hindsight, there is a sense that the programme makers have barely scratched the surface in terms of what they could do with the technology. There is a sense of the programme evolving as the series goes on. Even though the big changes don't kick in until Series 3, we seem the producers experimenting with the odd new idea or new room throughout the first two series. It's all good stuff but the best is yet to come. "Join us again soon for Knightmare..."